Arguably the most important resource for designing are stitch dictionaries. Ask any designer their favorite, though, and you’re sure to get a wide variety of answers. Shoot, even I don’t have an absolute all the time favorite – it all depends on what sort of design I’m working on. I’ve tried to keep it to stitch dictionaries as opposed to pattern books that have a secondary small section of stitches, but I’ve included a few of those as well. All opinions are my own — feel free to agree or disagree in the comments! If I’ve missed a favorite of yours, please also comment. And before I start…for help reading charts: Charts Made Simple (J.C. Briar). Highly recommended! Barbara Walker 1-4. 1 and 2 are essential, 3 and 4 are nice to have. 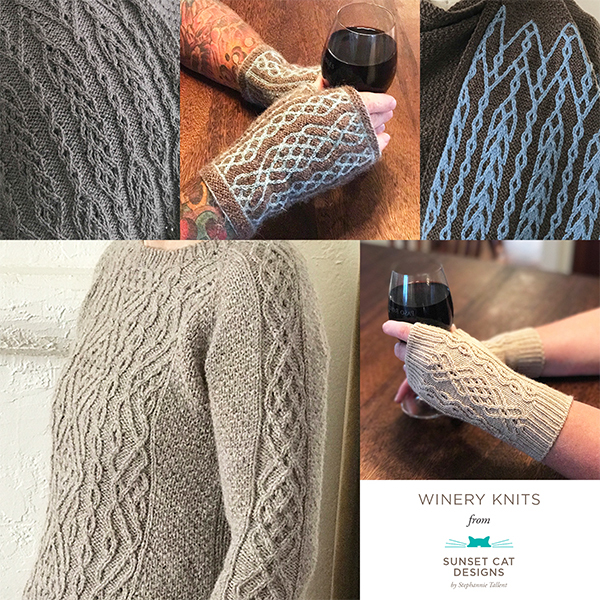 You get a little bit of everything with these: texture, lace, cables, slip stitch patterns, etc. Knitting Brioche (Nancy Marchant). This one does include patterns, but it does have a large selection of stitches too. Omas Strickgeheimnisse (Erika Eichenseer et al). I hardly refer to this one. Knitting Lace (Susanna E. Lewis). Ditto. The Haapsalu Scarf (Siiri Reimann et al). Stitch patterns are shown as parts of complete shawls. Lovely oversized book. Not necessarily easy to get; check with your local yarn store or shops like Schoolhouse Press or Village Spinning and Weaving. Heirloom Knitting (Sharon Miller). Great for vintage Shetland patterns. I have other lace books and patterns (Niebling, Kinzel, Estonian lace, etc) that I actually use a lot, but they aren’t strictly stitch dictionaries. I do recommend getting Clear & Simple Crochet Symbols and Clear & Simple Knitting Symbols before tackling the various stitch dictionaries. Also check out my Japanese knitting resource page here. Japanese stitch patterns in the dictionaries I have range from textured to lace to cables and twisted stitches. Many of the designs are very feminine and intricate. You can lose yourself in these dictionaries! Some of the Japanese pattern books are also a good source for stitches. I usually purchase these from YesAsia, but have included Amazon affiliate links below (if available) if you’d rather purchase via Amazon. Knitting Patterns 260. Just got this one, so haven’t used it yet. Knitting 150 Designs. Again, just got it, so no comments yet, except this has some colorwork and garment and accessory patterns as well. 500 Knitting Pattern World of Chie Kose. This has some really lovely crochet edging patterns that I’ve used (which was the main reason I bought this one). It also has a mix of knitting patterns to include colorwork. Knitting Patterns 300. Variety of stitches. Knitting Patterns 250. One of my favorites. Knitting Patterns 100. This one is cables, and some of the swatches are just so pretty — great combinations of stitch patterns to study. Ooh, fun. Get ready to dig in! Patterns for Guernseys, Jerseys, and Arans (Gladys Thompson). What it says. I don’t use this one often. Aran Knitting (Alice Starmore). Basic selection of cables, but worth studying the patterns – she’s a master. Aran Sweater Design (Janet Szabo). Not a lot of stitch patterns (though she has a nice discussion of closed ring cables and filler stitches), but she walks you through designing an Aran sweater. Well worth having. Cables Vol 1: The Basics (Janet Szabo). Nice selection of basic cables, and includes discussions of the components of the stitch patterns and what’s actually happening with the fabric etc. Unfortunately there’s not a Volume 2. Annie’s awesome. So awesome she gets her own section. Honestly, these are my go-to dictionaries when I want cables. I’ve started a spreadsheet noting which patterns I’ve used and in what designs. I often end up adapting these stitch patterns (inspired by Annie’s creativity! ), swapping out filler stitches, changing regular cables to lace cables, etc. I buy these as soon as they are published. Annie used to sell hard copies, but the latter six are PDFs. I can’t even say what’s my favorite or most used, because I dig through them all. Buy them all – you won’t regret it! You can purchase Aran Lace from Amazon; that, and all the others, can also be purchased through Needle Arts Knitting. Aran Lace. With Annie’s blessing, I developed a class around the topic of Aran Lace which I taught at Madrona and Taos, and turned into my Aran Lace Knitting DVD from Interweave. Stitch Definition. Aran lace, but also cables and lace separately. Cable Inventions Vol 1: 33 Textural Designs. These are cables and lace cables with additional bits of texture. Uberlieferte Strickmuster Teils 1, 2 and 3 (Maria Erlbacher). I purchased these volumes via the Schloss Trautenfels site. Luckily, you can now get…. Twisted Stitch Knitting (Maria Erlbacher) from School House Press. Includes all three volumes in one book, with a nice intro (in English!) on how to read the charts etc. I do use the smaller volumes more, just for being able to flip through and compare stitch patterns, but if I didn’t already have the individual volumes first I’d be more than happy with the School House Press edition. Bauerliches Stricken 1, 2, and 3 (Lisl Fanderl). Not just twisted stitches; includes a bit of lace and texture as well. I don’t use this one as much.